I had a pretty productive day! Unfortunately, I also discovered today that my stupid light fixtures inside the camper still don’t work! I don’t know what is the problem this time. There seems to be power going to them and the outlets on the same circuit work when I plug in the main power inlet, so who knows. I called the guy from RV Masters, and he’s going to come by tomorrow to have a look at them. He’d better fix it! 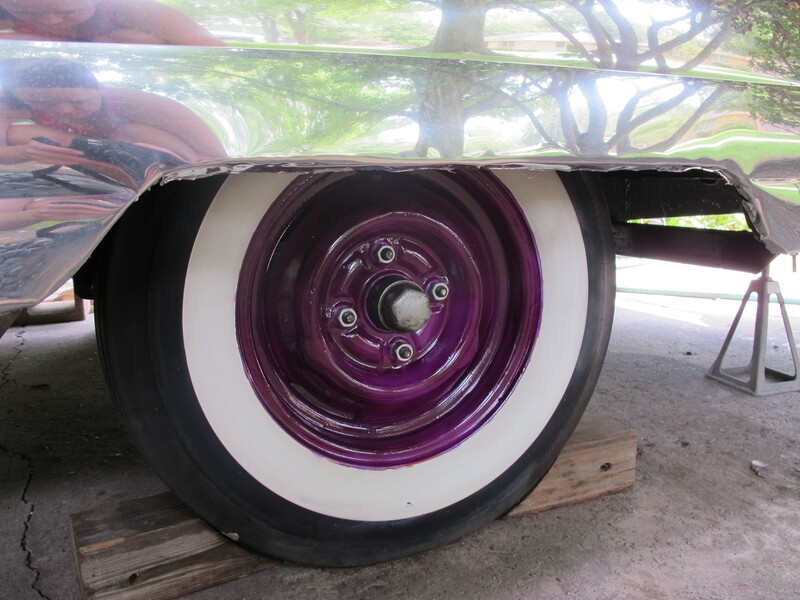 The first thing I did today was paint the wheels. 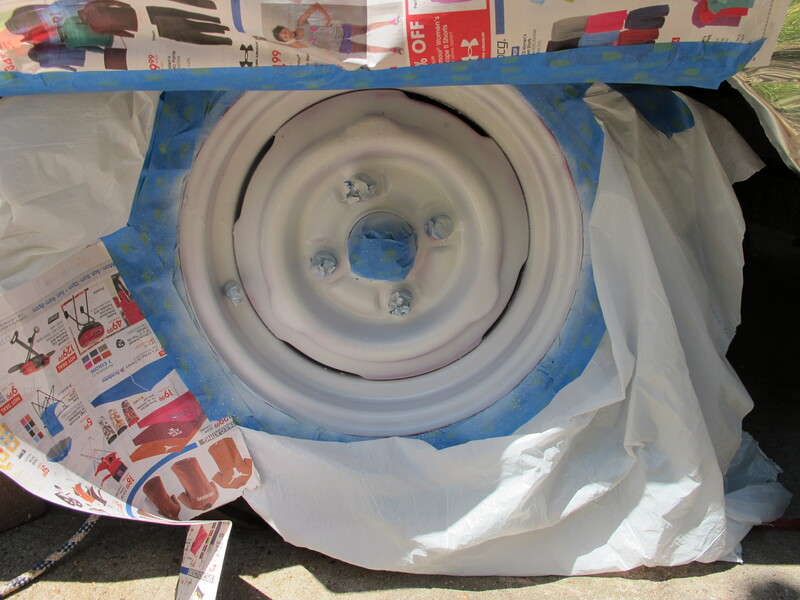 The thing I hate about painting is all of the preparation that it takes. 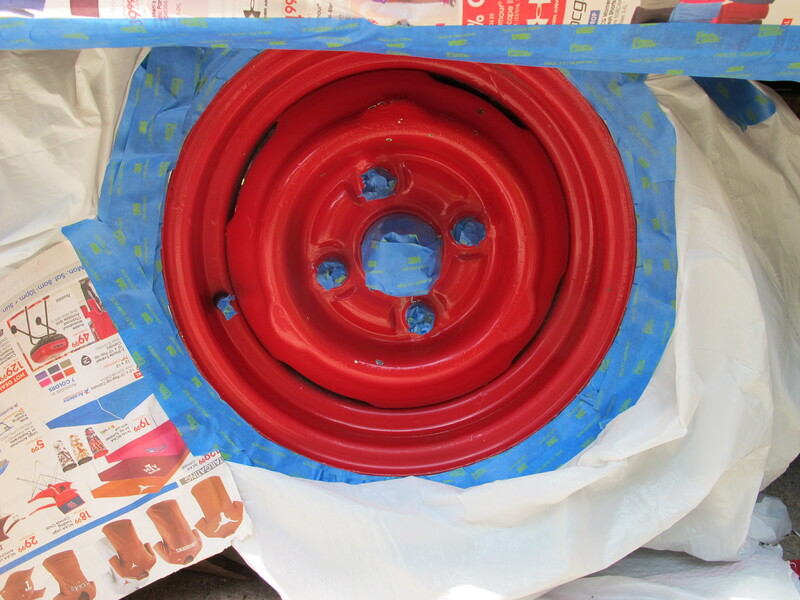 It took me much longer to prep the area for painting than it did to do the actual painting. Oh well, in the end, it was worth it! I think they look pretty. 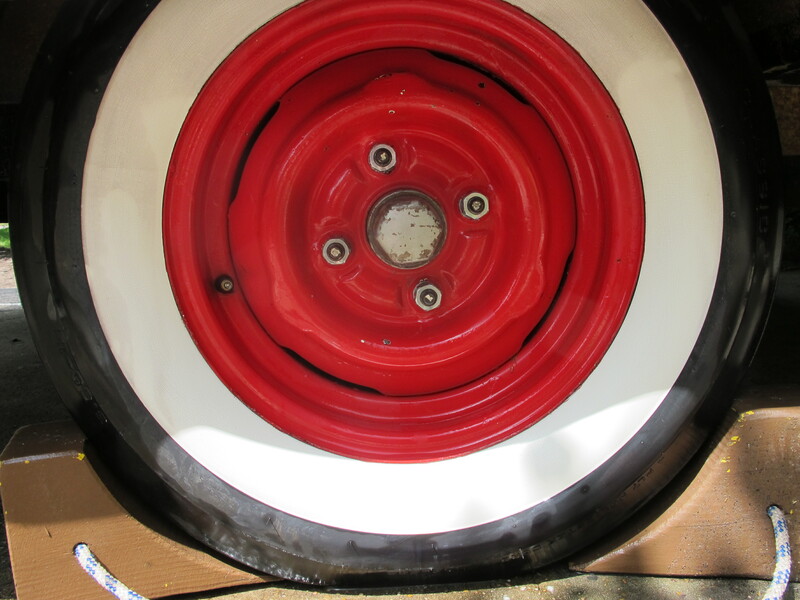 First, I had to clean the wheels with degreaser. 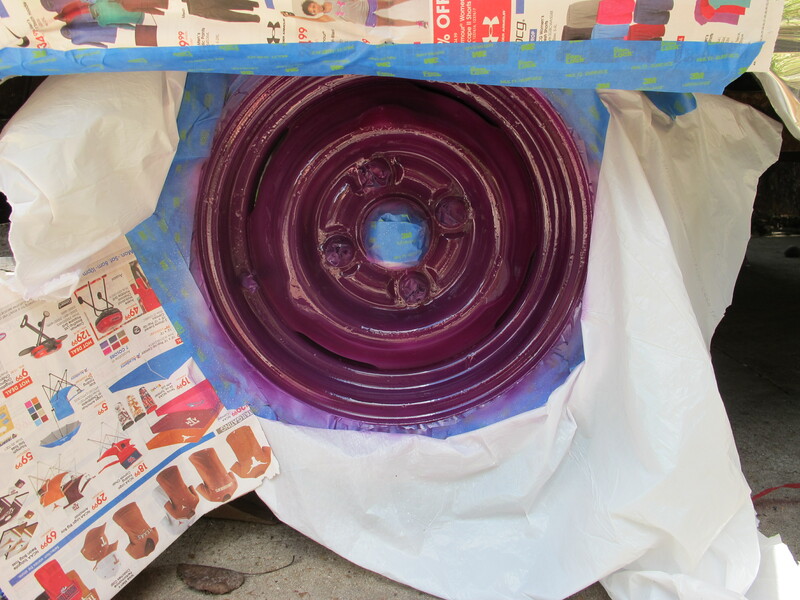 While I was in the process of painting the wheels, I finished painting the closet too. 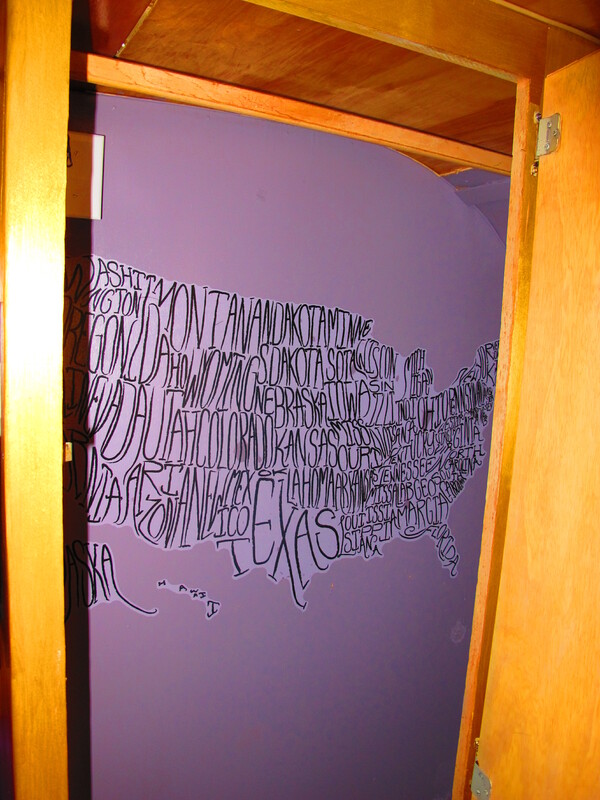 Later, after the paint was dry, I installed the vinyl wall map of the US on the closet wall. I think it looks pretty cool! I also finished moving the exterior outlet and patching the previous hole. 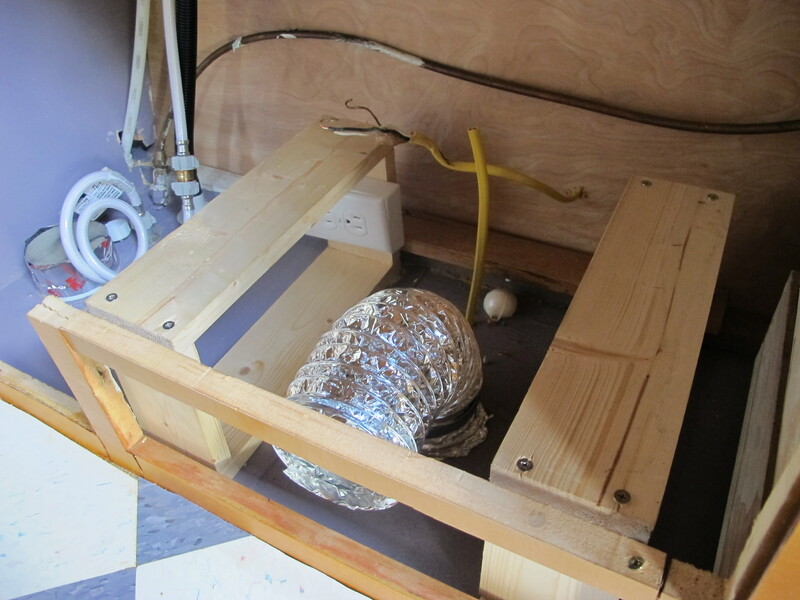 I added some flexible duct work to lead to the vent for the AC on the interior of the camper. 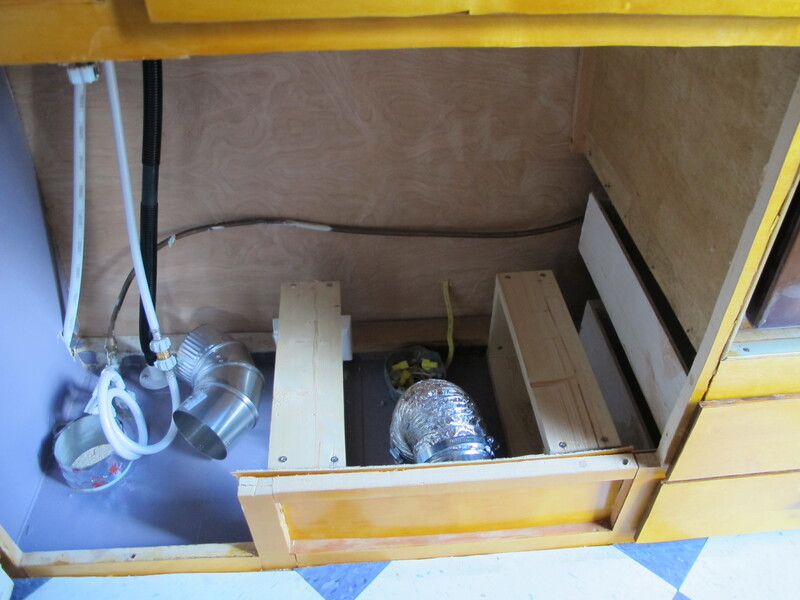 I still haven’t added a vent cover, I’m not sure if I will, or if I’ll just attach another piece of duct work when I’m inside the camper to make the air flow upward toward the bed area. I added another piece of paneling in front of the AC duct to cover it when it’s not in use. I can remove that piece to reveal another piece of paneling with a hole in it so that the air can flow out from the AC duct when I’m using it. After finishing those things, I finished securing the drawer under the bed and added some support to the beams that hold up the bed cushions. I also hung some pictures and installed the closet door. 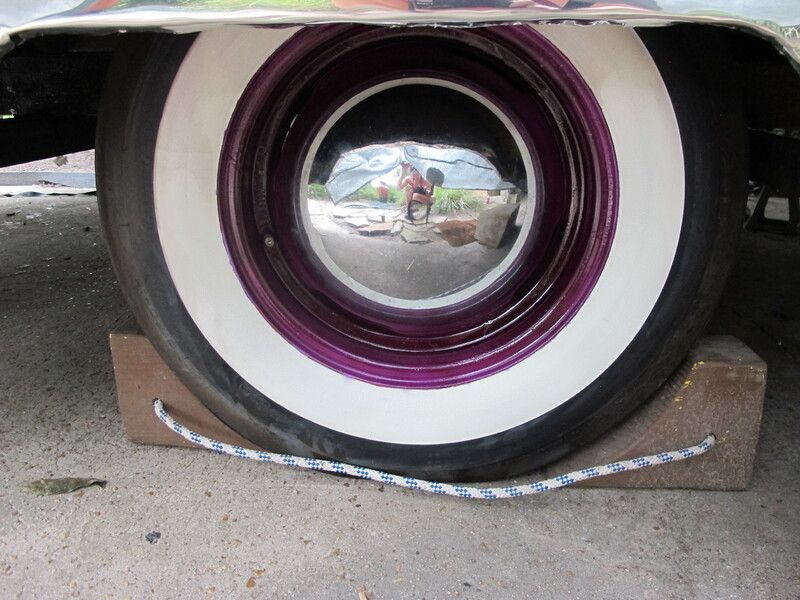 I don’t want to show a picture of the entire interior until after my big reveal party next weekend, but I’ll share one of the street side, just to give you an idea. 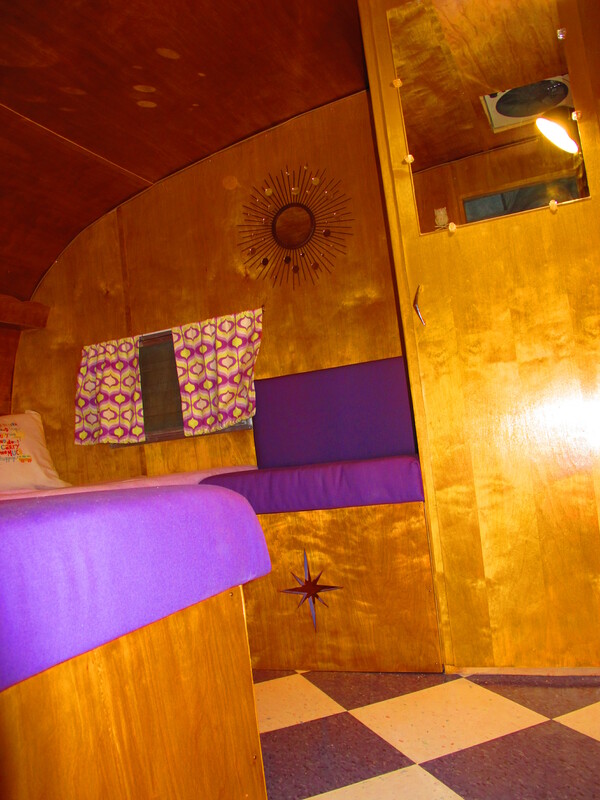 Posted in 1961 Shasta Restoration Project and tagged 1961, 1961 Shasta Compact, birch, canned ham trailers, DIY, glampers, glamping, Houston, interior vintage camper photos, Junebug, projects, renovation, renovation projects, restoration, Shasta camper, Shasta Compact, shellac, Sisters on the fly, Texas, Tin Can Tourist, tiny houses, travel trailers, Vintage Camper Rally, vintage camper restoration, vintage campers, vintage Shasta. Bookmark the permalink. Haven’t posted in a while but this camper is better than new! You have really out done yourself Jannica! Thanks Erik! I was feeling really good on Friday when I posted this, but yesterday I got pretty down about the electrical system. I am still trying to figure out why it’s not working. All of my receptacles are getting power in the right places, but they’re not getting enough power. I am about to go buy a multi meter and test everything separately to see where the problem is. Wish me luck!